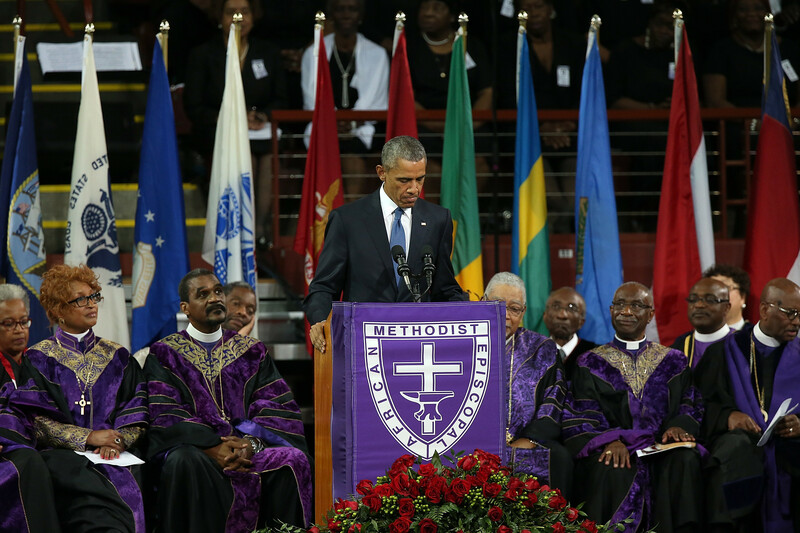 President Barack Obama delivered a stirring eulogy at the funeral for the Rev. Clementa Pinckney, a South Carolina state senator and pastor who was one of nine people shot and killed at Charleston's Emanuel African Methodist Episcopal Church last week. "The Bible calls us to hope. To persevere, and have faith in things not seen. They were still living by faith when they died, the Scripture tells us," Obama said of Pinckney and the other shooting victims, who the president said were "each at different stations in life but bound together by a common commitment to God." "Good people. Decent people. God-fearing people," Obama added. "People so full of life and so full of kindness, people who ran the race and persevered, people of great faith. To the families of the fallen, the nation shares in your grief." 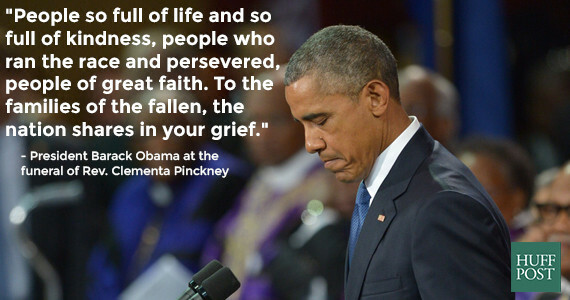 Obama addressed Pinckney's murderer during his eulogy, saying, "He didn't know he was being used by God." "Blinded by hatred, the alleged killer could not see the grace surrounding Rev. Pinckney and that Bible Study group," Obama said, saying the killer "failed to comprehend what Rev. Pinckney so well understood -- the power of God’s grace." 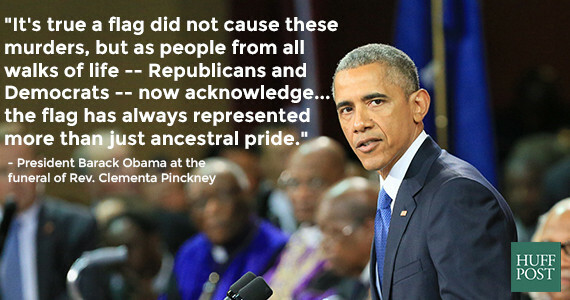 Obama talked about his history with Pinckney, recalling when they first met. "I cannot claim to have had the good fortune to know Rev. Pinckney well, but I did have the pleasure of knowing him and meeting him here in South Carolina back when we were both a little bit younger. Back when I didn't have visible gray hair. The first thing I noticed was his graciousness, his smile, his reassuring baritone, his deceptive sense of humor -- all qualities that helped him wear so effortlessly a heavy burden of expectation." Obama spoke on the importance of church to African-American life and specifically spoke of the Emanuel AME Church's historic significance. "The church, built by blacks seeking liberty, burned to the ground because its founder sought to end slavery, only to rise up again -- a phoenix from these ashes," Obama said. Obama also addressed the controversy over the Confederate flag during his remarks. "It's true a flag did not cause these murders, but as people from all walks of life -- Republicans and Democrats -- now acknowledge... the flag has always represented more than just ancestral pride," Obama said. "For many, black and white, that flag is a reminder of systemic oppression and racial subjugation. We see that now." Obama said removing the flag from the South Carolina Capitol grounds isn't a rebuke of Confederate forces, but rather of what they fought for. "The cause of slavery was wrong," Obama said. Obama touched on racism, saying "the subtle impulse" still exists "to call Johnny back for a job interview but not Jamal." Obama also spoke about gun violence during his remarks, saying each life cut short by a gun is important to remember and noting "the vast majority" of Americans and gun owners want to make changes to prevent gun deaths. He doubled down on his remarks that gun control laws won't prevent every tragedy, but they could save a few lives. Some who spoke after Obama referred to him as "the Reverend President." We see when "our brothers and sisters are cut down in a church basement, 12 in a movie theater, 26 in an elementary school, but I hope we also see the 30 precious lives cut short by gun violence in this country every day," Obama said. Pinckney was taking part in a prayer meeting at the church on June 17 when he was killed. Obama initially gave a statement calling the shooting a "tragedy," noting other advanced countries don't typically see this type of mass violence. Obama has had to address homicidal gun violence 14 times during his presidency, according to a count by CBS' Mark Knoller. In his eulogy Friday, Obama said the shooting "has allowed us to see where we've been blind." "[God has] once more given us grace, but it's up to us now to make the most of it," Obama said. Obama said it wouldn't be fair to Pinckney's legacy "to go back to business as usual" after the funerals for the nine victims of the Charleston shooting have concluded. "It would be a betrayal of everything Rev. 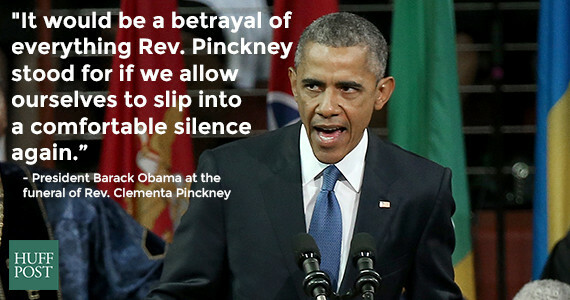 Pinckney stood for if we allow ourselves to slip into a comfortable silence again," Obama said. "It would be a refutation of the forgiveness expressed by those families [of the Charleston victims] if we slipped into old habits," Obama added. As he ended his remarks, the president began to sing "Amazing Grace," leading the crowd in the song before naming each of the shooting victims.